Neil Taylor and Jonjo Shelvey have welcomed Garry Monk as Swansea manager on a permanent basis. The Swans announced Monk, 35, had agreed a three-year deal on Wednesday having been in temporary charge since Michael Laudrup's exit in February. "It's great news for Garry and great news for the club," said Taylor. Shelvey said: "He knows his football - he's worked with Brendan [Rodgers] and Roberto Martinez so I think it'll only benefit the club." He added: "He is a mate but he's a manager as well, so it's reassuring to know he's in charge next season and I'm sure we can kick on from here." Taylor played alongside Monk before the former captain took over the reins when Laudrup was sacked. Taylor has been impressed by the way Monk has handled the switch to manager after spending nearly 10 years at the club as a player. "It's been weird seeing the transition really, but it's one that Garry can handle," added Taylor. "He's always been a captain and a leader at the club, so we knew he could take on a role like that. "He wouldn't have expected it to have come this quickly - no-one would have - but he's been thrown in the deep end and he's done really, really well and he's kept the club in the League." Swansea's 4-1 win over Aston Villa on 26 April secured the club's place in the Premier League next season with two matches to spare. They play their final game of the season at Sunderland on Sunday. Taylor thinks the decision to make the appointment before the end of the season will work in Monk's favour. "He's been given the whole summer now to prepare and he'll probably see how tough football management really is, but I think he's ready and I think he'll do really well," he said. "We start again now, recruit well in the summer and hopefully next season won't be as tough - obviously no Europa League. Hopefully we can get back to where we were in the Premier League last season and the season before that. 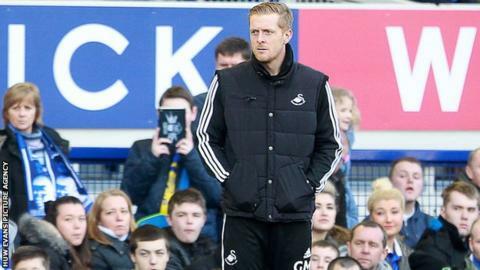 "I think Garry Monk knows where the club's been and where it needs to go."